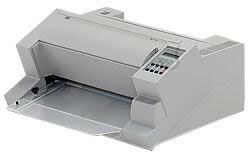 Line Matrix Printers remain the workhorse solutions for global supply-chain and back office printing applications because of their reliability and low total cost of ownership. Line matrix printing (or impact printing) remains the unchallenged leader in reliabilty. When pressed to keep costs under control, supply chain and back office applications look to this technology to deliver the lowest cost-per-page output and the most dependable long term performance.